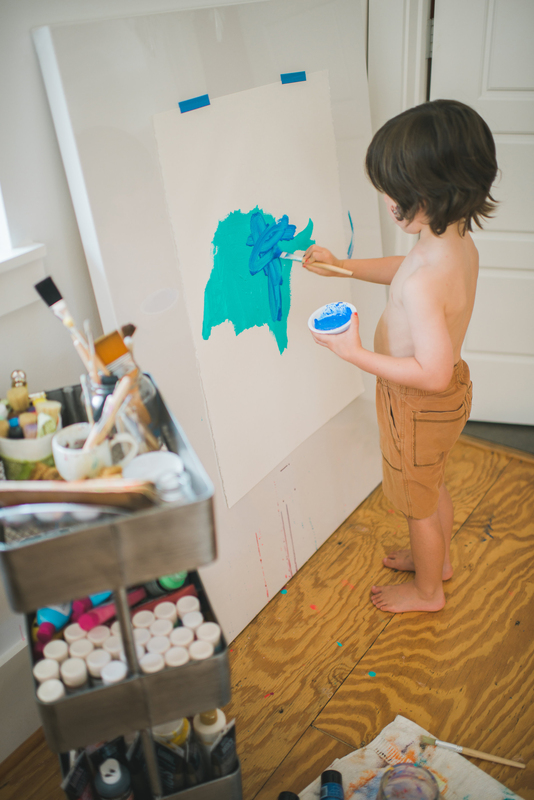 This little guy of mine has been very into painting lately. We had been using watercolors for the longest time because he loved to paint the entire 9”x12” sheets solid with a variety of colors all washing into each other. It was an easy thing for me to set up for him at the kitchen table while I made breakfast in the morning. But recently I could tell he was getting a little tired of the same old same old. So I went to our local art supply store and bought some huge sheets of thick paper. These sheets are 24” x 26” and have a slight texture to them. I’ve been taping them up and letting him loose with bigger brushes. He picks 2-3 colors and I pour them into little individual trays or on a bamboo plate and let him do all of the rest by himself. This set-up is in my studio, so I can watch him create while I create, too. And in my studio we don’t worry about paint splats on the floor. The unfinished wood floors were purposely installed for stress free paint splats, spills and smears—all which add to the character of the floor. 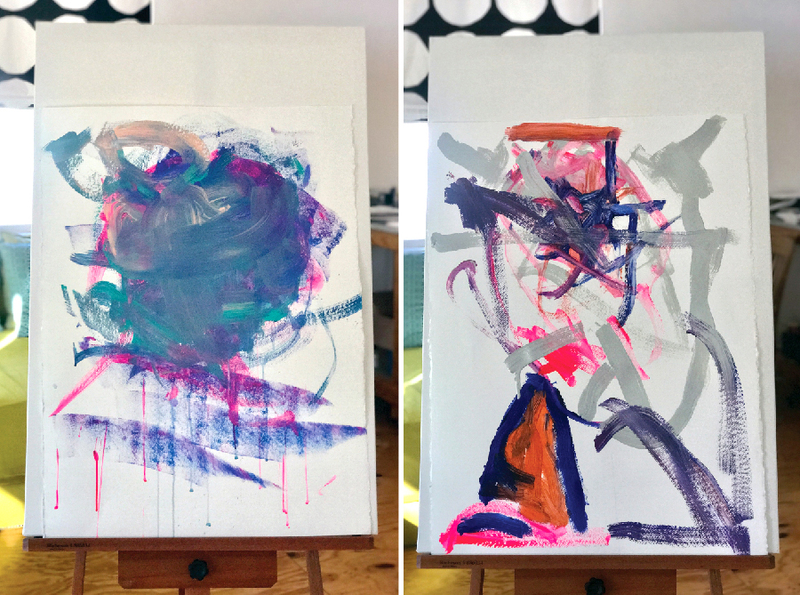 And yes, his works of art are mostly blobs of paint running into other blobs of paint, but he’s making those blobs all on his own. And watching him create is such a sweet experience for me. 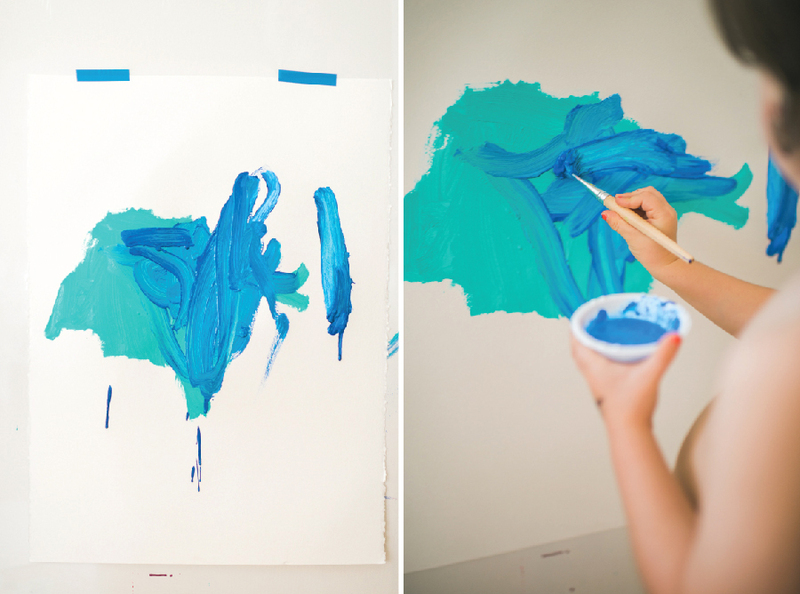 How he’s brushing, swashing, splatting and moving is just as artistic as the end product. 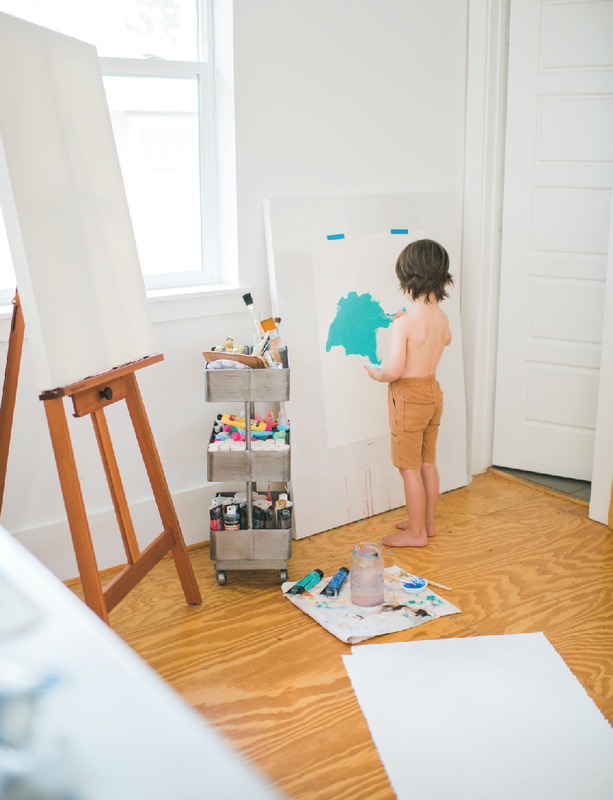 To me art (in this case painting) is about letting my little one just be, and not worrying about opinions. Making something tangible and allowing his mind to grow. Squatting, bending, standing, mixing, talking, laughing, playing and experimenting. 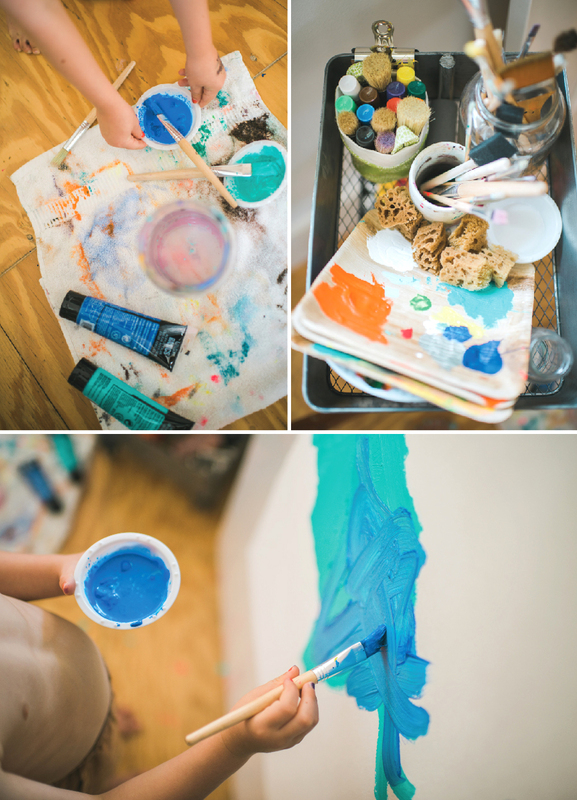 PS I’ve written before about the beauty of easy art projects for kids. Ones you can do with minimal prep, minimal supplies and minimal cleanup. See others here and here. Supplies needed: Large sheets of paper and any type of paint. We used acrylic paint that I mixed with water because I like the drips. And you don’t necessarily need little individual paint cups, but they are extra fun. Photography by Rebecca Sanabria, only she didn’t take these last two. As I was laying it out, I realized it would have been nice to have asked Rebecca for some shots of his other works, not just what he was painting on the day she took photos. So I pulled these out and snapped some quick shots on my iPhone because I think it’s interesting to see more than one. Enjoy! Go create!